If you are a die-hard Coastie fan, a family member of one, or a Coastie yourself, then you might have noticed this incredibly romantic photo floating around Twitter last week. Fireman Stefanie Garrett displays her answer after Chip Switzer asked her to marry him. Garrett is a member of the engineering department aboard the Coast Guard cutter Midgett, which returned from a 75-day counter-narcotics patrol, March 21. Coast Guard photo by Petty Officer 2nd Class George Degener. The Coastie with the wide smile is Fireman Stefanie Garrett returning from a 75-day patrol aboard the Coast Guard high endurance cutter Midgett. The sign she’s holding? It’s a reply to a dock-side banner proposal. Her boyfriend, and now fiancé, Chip Switzer waited for hours by Pier 36 for a glimpse of Garrett as the Midgett returned to its Seattle home March 21. It took some heavy coordination between Switzer and crewmembers aboard the Midgett, but when the cutter pulled in, Garrett was on deck looking out at the crowd welcoming the Coasties home. 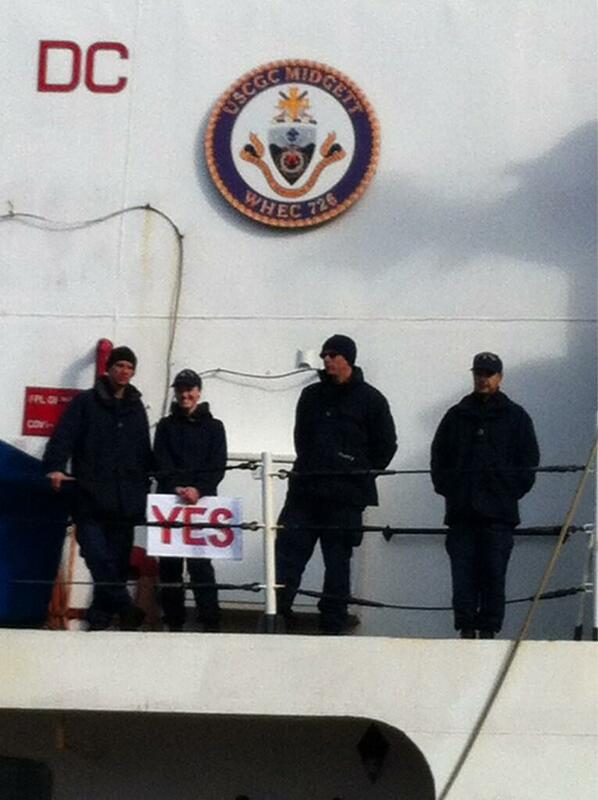 Crewmen aboard the cutter handed Garrett a sign with the word “Maybe” emblazoned on one side and the word “Yes” on the other. As the photo shows; she said yes. The couple, who met at a party in Seattle, has only been together for about six months, but Switzer said that was enough time to realize he wanted to marry Garrett. “You just know,” Switzer said.